The little voice inside Steve's head went off like an alarm. Here he had accompanied Jules Coleman as usual on one of their joint CES sprees only to find himself glued to a chintzy couch inside Eduardo de Lima's Audiopax exhibit, surrounded by moonies Jeff Day, Marja Vanderloo, Henk 'Longbeard' Boot, Ivette and Srajan. To add insult to injury, buddy Jules was busy negotiating automotive lacquers with the designer, hoarding all the hot review stuff for himself as a newly converted mooner. Steve didn't know it yet but a suspicion began creeping up on him. All of this wasn't by any chance a coincidence, was it? Over dinner later that day, an inspired publisher volunteered the notion that one of his dreams was to see vintage audio compared to some of the current crop, to determine how much progress had really been made. If some of this classic stuff still held up or possibly proved bona fide competitive value, how to sort the diamonds from the coal? One would need an expert in yesterday's gear to pick the hot items - an expert who was also conversant in today's status quo. Suddenly attending CES with Jules no longer seemed like such a hot idea to Steve. Nonetheless, he struggled valiantly to not let this foreshadowing of dim events show on his face. I can still hear my mother proclaiming loudly (no, Mom, you weren't shouting!) up the stairs at me while I was practicing trumpet in junior high: "Your tone was not good on that piece!" To this day, I cannot abide a stereo system that doesn't have proper tonal balance and full tone. So from Mom it was that I inherited my number one audio bias. In the bedroom next door, my brother would be torturing us all with his twentieth repetition of Sentimental Journey for his next Blue Blazers jazz band concert. Not to worry, he offered the musical antidote, too - high doses of Janis Joplin, Santana and John Mayall all blasting from his stereo. With college fast approaching, I just had to score a serious stereo for my freshman dorm room. I scoured the mail-order catalogs and ordered a complete AR system from Stereo Discounters in Maryland: ARXA turntable, AR receiver and AR-2ax speakers. That system served me well until I succumbed to the Japanese direct-drive turntable invasion with a Technics SL-1200. You know the story - Julian Hirsch said it was better. Skipping ahead to 1987, I had my most ear-opening audio experience via a new audio acquaintance I had met in the local high-end audio store. Being an ardent reader of TAS from about 1978 on, I had dutifully purchased the Kenwood LO-7M monoblock amplifiers that were Harry Pearson's fave. I had these driving Nelson-Reed 804 speakers. Well, this affable new friend of mine offered to bring over his GSI-modified strapped Dynaco ST70s. While I had listened to plenty of Dynaco tube equipment at a friend's house during high school, I had never actually compared tubes to solid state, directly. 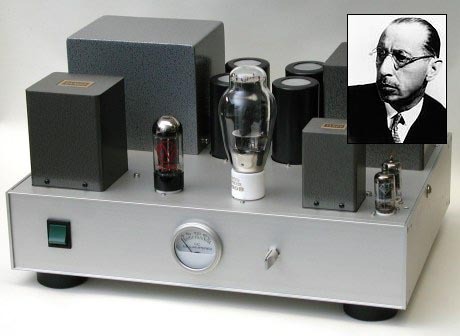 Audiophiles from this period will remember that tubes were not really in favor. Only Audio Research and Conrad Johnson were still carrying the torch. Well, the GSI Dynaco amps really put my Kenwoods to massive shame. From that point forward, I have never owned a solid state preamp or amplifier (although I keep trying them and have liked some pretty well). All of this set my mind to the possibilities of great sound from vintage gear. I quickly fell into the vintage audio underground, devouring Walt Bender's Audiomart publication as soon as it came into my mailbox. Of course, the really good stuff never even made it into the ads if you know what I mean. My friend also made me aware of the budding Connecticut Audio Society (CAS) which I promptly joined. This group began as an assortment of technically knowledgeable DIYers, most of whom wouldn't be caught dead purchasing a high-end component from a local shop. In our own defense, most of the club members had better sound than we heard in any of the stores! One of our members built his entire stereo system including the turntable from scratch. Another built his own homebrew Audio Research SP10 tube preamp in his basement in one weekend! After serving as Activities Coordinator and then President of CAS, I can say that I've gained a lot of experience from this group. I would be woefully negligent if I did not mention my friend, Arthur Loesch. I think everyone in the vintage/DIY underground knows of him. 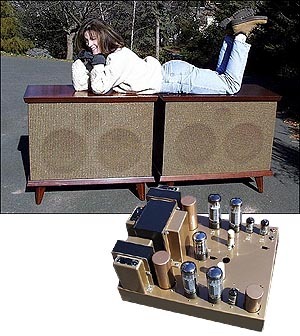 Most would agree that Arthur is largely responsible for the rebirth of DHT tube amplifiers in the United States. He is a professor at SUNY/Albany who has been building his own tube equipment for a long time. When he called on my Audiomart ad in 1987, I ended up listening to him fervently preach to me about the glories of triode tube amps and the WE 300B tube. Here was a man on a mission. Being a skeptic and the farthest thing from a cult follower, I jumped at his invitation to visit and hear this supposedly wonderful tube. Arthur spoke of Jean Hiraga's articles in La Revue Du Son, the British Audio Innovations triode amps and other strange and mystical things. Well, I heard his SE300B amps on his efficient two-way satellites with Focal drivers in SOTA cabinets, with separately powered Onken bass enclosures. I was astonished! Since then, I've gone through a slew of modern and vintage equipment. While my current system is modern, I plan to use it a tool for evaluating vintage components. Vintage diehards will criticize this approach by saying that you need to use vintage gear with vintage gear. On the other hand, my current system is very revealing and will serve as a powerful microscope. Okay, enough historical background. Where does the rationale for vintage audio fit into 6moons? For starters, let me repeat a commonly heard statement about audio: Almost all systems have some weakness or compromise. We all know of systems that do large-scale music well but then blow up image size disproportionately on small-scale music. There are other systems with amazing clarity which can be a bit peaky - i.e. Lowthers. In other words, most of us are accepting some sort of trade off in our systems. If you think I'm going to say that vintage audio is inferior to modern hence why not accept that as another trade off, I'm not. What I am going to say is that vintage audio excels in certain aspects of music reproduction and is weaker in other areas, just like modern equipment. Tonal balance and rich tone are hallmarks of vintage tube amplifiers and preamplifiers. Ultimate resolution and detail often are not though parts upgrades can improve this greatly. Vintage speakers can be a little dicey, with a number of them suffering glaring frequency response aberrations. But that's not necessarily true all across the board. Regardless, I am no vintage extremist like those who post in Yahoo's Hong Kong Tube Audio Group. These folks pretty much shun all modern equipment as a matter of principle. I will say that I have owned and listened to many a vintage component or speaker that has put even expensive modern equipment to shame. Here's one example from my own experience. I used to own one of the kings of vintage horn speakers, the Jensen Imperial three-ways. 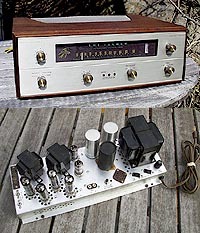 I used Marantz 5 monoblock tube amps on them but had a modern Audio Research Reference One line stage. One day my friend Rich brought over his vintage Pilot SP-210 preamp with a custom outboard power supply, with the Pilot known to have one of the best-sounding line stages among vintage preamps. We popped it into the system and were shocked that, overall, we actually preferred the Pilot. It did not quite have the detail of the ARC, but it had much nicer tonal balance and good dynamics. I sold the ARC shortly thereafter. If you're tired of taking a financial beating every time you upgrade your system, going vintage is the cure. In fact, if you keep such components for more than a year or so, you can usually sell it for more than you paid. Equipment swappers rejoice! Even if you're dedicated to modern equipment for your main system, why not consider a modest vintage system for your bedroom or den? At the very least, pick up a KLH 21 FM radio and put it in your kitchen. I've got three of them in my house - in the bedroom, kitchen and laundry room. My professional background is similar to fellow moonie Jeff Day's in that I have a Ph.D. in the Biological Sciences. However, in the late 80s/early 90s, I had a life-altering illness that knocked me off the scientific career track. For over two years, I could not work at all. During said time, I used my stereo as a source of healing and to this day strongly believe in the power of music over body and soul. Of course, now this is fairly commonly accepted and the field of music therapy has arisen. After recovering, I did the best I could and converted my science interest into the environmental management field. I am a strong environmentalist and weave these beliefs into every aspect of my living.